Depending on who you ask, this might be one of the best times to buy a new computer. We would be inclined to agree: there’s just too many cool things going around at the moment, like Intel’s latest Skylake generation, improved graphics on laptops, Windows 10 and general advancements on both hardware and software that have made computers more attractive than ever. This is the review of the HP Pavilion 15-au030nr, one of the best proofs of everything we just said. It’s a mid-to-high end machine with great specs and a reasonable price, and we just can’t help but analyze it a little just to drive our point home. Pros: Great Full HD display, powerful Skylake Core i7 processor, 12GB of the latest generation RAM. Cons: no backlit keyboard, standard hard drive. 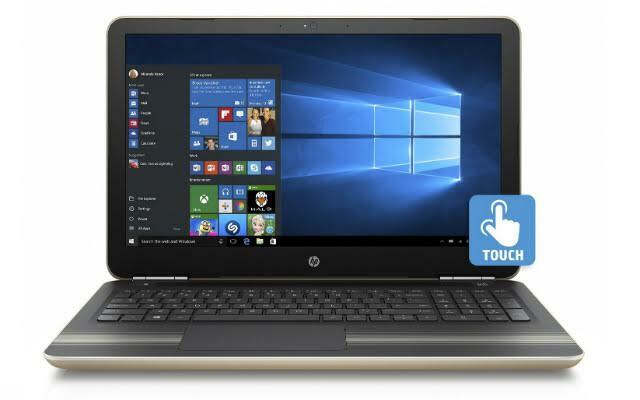 Aesthetically, this one will inevitably stand out thanks to the golden finish on the outside of the body that goes with the iconic HP logo. On the inside we find a more conventional black, though, with a full-sized keyboard that includes a numerical pad but, unfortunately, no backlit capability. That big keyboard is there thanks to the laptop’s size: it has a 15.6 inch screen, which translates to a medium size machine with a form factor that is desktop friendly and ideal for multimedia consumption. That screen, by the way, is nothing to sniff at: it’s a full-fledged 1080p touchscreen with IPS technology for perfect viewing angles. So, basically, one of the best configurations you can get on a laptop display. Simple tasks like web browsing, office work and multimedia playback will go without a hitch, but you’ll also be able to handle complex applications for activities like editing, design, and more. In this review of the HP Pavilion 15-au030nr we find ourselves with an Intel Core i7-6500U, a dual-core processor clocked at 2.5 GHz (3.0 GHz with Turbo Boost). This is one of the most powerful chips from the ultra low voltage line that Intel offers for laptops and, as such, you’ll find both advantages to aspects like battery life and, of course, performance. Simple tasks like web browsing, office work and multimedia playback will go without a hitch, but you’ll also be able to handle complex applications for activities like editing, design, and more. As if that weren’t enough, the 12 GB of DDR4-2133 MHz SDRAM included, a spec that stands above the average, will have you multitasking like a champ. This time around we don’t have a dedicated graphics card available, but the integrated unit that comes with the CPU: the Intel HD Graphics 520. As expected, you won’t find gaming performance here, but you should be able to run some modern games on low settings. Less heavy titles like The Sims 4 and FIFA 16 should be playable at a pleasant level, however, and both older classics and simple indie games will almost certainly play without a hitch. So in short, this is a laptop that’s gaming capable, but not gaming focused. HP includes a 2-cell, 41 Wh Li-ion battery, and it also claims that it’ll last up to 7 hours on it. Expecting a bit less is always a healthy practice, and if we expect 6 hours, that’s still a pretty great number anyway. As every other gadget, though, battery life will wildly vary depending on what you are doing, so keep that in mind. A 15 inch laptop without decent connectivity would feel incomplete, and thankfully the HP Pavilion 15-au030nr offers what we would expect from a machine of this caliber. We start with one USB 2.0 port couple with two other 3.0 ones. There’s also an Ethernet port for wired internet connection, an SD card reader, the usual audio/mic jack and the ever helpful HDMI port for external displays. To top it all off, it also comes with an optical drive for those who are still fond of music CDs, DVDs or the format in general. Finally, on the storage corner we find ourselves with a 1 TB mechanical hard drive with a 5400 RPM speed. Though not the fastest, that big space will certainly come in handy for storing basically everything you need. You probably won’t run out of space anytime soon. And, if you’re looking for a faster unit, changing it won’t be a problem. What’s the verdict? Is it worthy of our money? After the review of the HP Pavilion 15-au030nr, we are left with a machine that pleases us thanks to its high-level components. The Full HD, IPS touchscreen and the powerful Intel Core i7 processor coupled with 12 GB of RAM are the stars here, as together they will offer a great experience for both desktop and more mobile users. This is, very clearly, a powerful multimedia machine. The optical drive (a feature less common every new day) will offer expanded capabilities for those who care about it. HP has landed a compelling mid-to-high machine with this one, so be sure to check it out.